Objective Insomnia is a highly prevalent disorder among patients suffering from stroke. The association between insomnia and stroke mortality is less studied, particularly using the latest diagnostic criteria. The current study examined the relationship between insomnia and mortality among patients with first-evonal hazard models were used to calculate HRs for stroke er stroke in China. Methods Patients with acute cerebrovascular diseases (stroke) were recruited from 56 hospitals in mainland China. Insomnia was defined as difficulty falling asleep, or difficulty staying asleep or waking up early, for at least two consecutive visits. Demographic data, medical history and clinical data were collected. 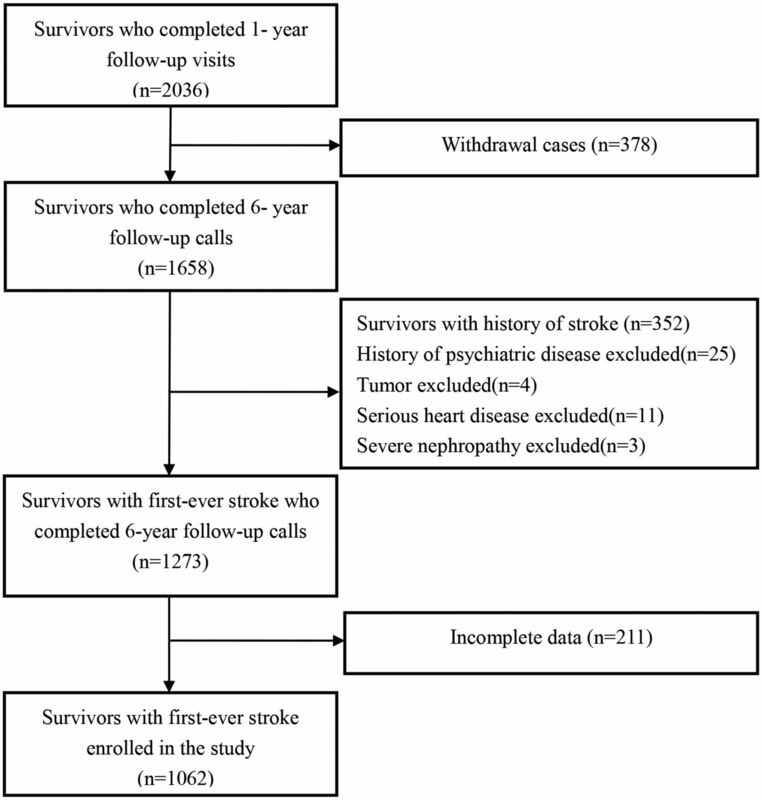 Four follow-up visits occurred within the first year after stroke, and the last follow-up call was conducted 6 years later. Cox proportional hazard models were used to calculate HRs for stroke mortality. Results Insomnia was reported by 38.4% (489/1273) of patients at baseline. During the 6 years of follow-up, after adjusting for all confounders, insomnia was found to be associated with increased mortality (HR=1.66, 95% CI 1.10 to 2.48). Old age (HR=1.08, 95% CI 1.06 to 1.10), stroke recurrence in the first year of follow-up (HR=2.53, 95% CI 1.48 to 4.31) and stroke survivors with hypertension (HR=1.62, 95% CI 1.04 to 2.53) had substantially higher risk of mortality. Conclusions Besides old age, stroke recurrence in the first year of follow-up and hypertension, insomnia is associated with increased risk of mortality in patients with first-ever stroke in China. More studies about prompt and efficient interventions for insomnia are expected in the future. Recurrence of stroke is common among stroke survivors with cumulative disability. Furthermore, patients with recurrent stroke have a 43% higher risk of dying than survivors with the first-ever stroke.12 However, previous studies have failed to distinguish the effect of recurrence when studying the relationship between sleep and mortality. The current study aimed to examine the association between insomnia and mortality in the first-ever stroke in the Chinese population. This was a 6-year follow-up study of patients with stroke. The baseline data were from a study titled ‘Prospective Cohort Study on the Incidence and Outcome of Patients with Post-stroke Depression in China (PRIOD)’.13 In this study, patients with stroke from 56 neurology departments were recruited between April 2008 and April 2010. Patients aged 18 years or older, whose conditions were confirmed by CT or MRI within 14 days of clinical presentation, were recruited based on the WHO criteria for stroke.14 The patients provided written informed consent and agreed to follow up. The study was conducted in compliance with the Declaration of Helsinki guidelines for the protection of human subjects. In this study, clinical physiologists who were responsible for the follow-up at each centre received systematic training on clinical assessment tools and diagnostic criteria. Follow-up assessments included the diagnosis of depression based on the Diagnostic and Statistical Manual of Mental Disorders, Fourth Edition (DSM-IV),17 and assessment of the Hamilton Rating Scale for Depression (17 items, HRSD-17) at day 14±2, 3 and 6 months, and day 360±7 poststroke.18 19 Stroke severity was assessed at baseline using the NIHSS. All deaths were identified from the local Disease Surveillance Points system death registries. The causes of death were coded according to the 10th International Classification of Diseases. Duration of follow-up was calculated from the time of the baseline evaluation to the date of death. Insomnia was ascertained using three items from the HRSD-17, consisting of the core symptoms of insomnia in DSM-IV.17 These three questions are the following: (1)‘Have you experienced difficulty falling asleep?’ (2)‘Have you experienced difficulty staying asleep?’ and (3) ‘Have you experienced waking up early and not being able to sleep again?’ Participants were classified as having insomnia if they reported experiencing one or more sleep conditions for at least three nights a week. Patients were classified as having insomnia if they reported experiencing one or more of the above items at two consecutive visits. The two successive follow-up times were at least 3 months or 6 months. Demographic characteristics, vascular risk factors and clinical characteristics were defined as the baseline in this study at intake time. Sleep factors of HRSD-17 in the four assessments during the first year were used to determine whether the patient had insomnia. Statistical analyses were conducted using the Statistical Analysis System (SAS) V.9.2 software. Continuous data are expressed as median (IQR). Discrete data are expressed as frequencies and percentiles. The χ2 test or Fisher’s test was used for analysis. Group differences of continuous data and one-way orderly data were analysed using the Wilcoxon rank-sum test. Cox proportional hazard regressions were used to calculate HRs and their 95% CIs. For all analyses, a two-tailed probability value of P<0.05 was considered statistically significant. Among 1273 patients with first-ever stroke, 16.6% (211) were excluded from the analyses due to incomplete follow-up, and 1062 patients with first-ever stroke who met the inclusion criteria were enrolled in the study (figure 1). No significant differences were found between patients enrolled (n=1062) and those not enrolled (n=211) (table 1). Flow chart of the participant selection. Among 1062 patients included in the analyses, 489 (38.4%) met the diagnosis of insomnia in the first-year follow-up, 132 (15.5%) suffer from one kind of insomnia listed above, while 356 (33.9%) suffer from mixed features, and 130 (9.4%) patients died. The group of patients with insomnia had significantly higher NIHSS score (5.21±4.38 vs 4.12±3.65, P<0.001), more female patients (39.9% vs 29.5%, P<0.001) and higher rate of depression (54.8% vs 20.8%, P<0.001) at baseline assessment (table 2). Moreover, patients with insomnia had a significantly higher recurrence rate of stroke (8.2% vs 4.4%, P=0.02) during the first-year follow-up and had significantly higher mortality (15.1% vs 9.7%, P=0.008) at 6-year follow-up than those without insomnia. No other significant differences were found between the two groups. Death within 6 years was associated with old age (69.7±11.0 vs 59.2±11.0, P=0.000), higher rate of insomnia (56.9% vs 44.5%, P=0.01), higher recurrence rate of stroke (14.6% vs 5.0%, P=0.000) during the first year of follow-up, lower education (58.5% vs 73.6%, P=0.000), lower employment rate (21.5% vs 51.2%, P=0.000) and higher rate of hypertension (76.2% vs 66.7%, P=0.03) (table 3). The multivariate Cox regression analysis revealed that age (HR=1.08, 95% CI 1.06 to 1.10), stroke recurrence in the first-year follow-up (HR=2.53, 95% CI 1.48 to 4.31), insomnia (HR=1.66, 95% CI 1.10 to 2.48; figure 2) and hypertension (HR=1.62, 95% CI 1.04 to 2.53) were significantly associated with death at 6-year follow-up (table 4). Kaplan-Meier survival curves by insomnia status at 6-year follow-up. This research adjusted many possible confounders, especially depression, as comorbidity, which was evaluated during the first-year follow-up. 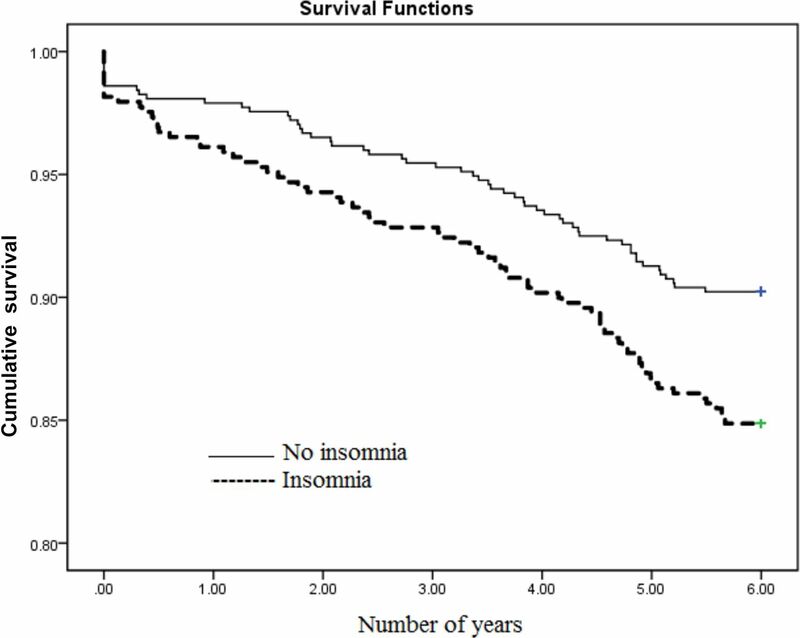 The association between insomnia and mortality was not essentially changed by depression.1 21 Also, the result concluded that old age and recurrent stroke within the first year were statistically the most important risk factors for mortality.22 23 The NIHSS scores were significantly more associated with insomnia, while these were not associated with mortality at 6-year follow-up. This result was consistent with another study by Luo et al 24, which exhibited that high NIHSS scores before treatment were associated with mortality at 90 days. This study found that stroke survivors with hypertension had a substantially higher risk of mortality (HR=1.61, 95% CI 1.04 to 2.53), and this result is consistent with previous investigations that showed that blood pressure and blood pressure variability were each associated with poor outcome.2 28 29 Some previous studies suggested that insomnia can lead to hypertension by activating the sympathetic system,30 31 impairing sleep quality, as well as decreasing insulin sensitivity and glucose tolerance.32 Hypertension and diabetes are thought to contribute to higher cardiovascular mortality risk. Extensive research has proved that insomnia increases the risk of mortality in patients with cardiovascular disease (CVD).3 25 33–35 Consequently, these two conditions might partly mediate the association between insomnia and death. Some studies found that patients with stroke who also had CVD or kidney dysfunction had a higher risk of death.15 36 In this study, subjects with severe physical illness were excluded, which might explain the weak statistical power of the result. Strengths of this study are its large sample size, first-ever stroke and extended follow-up. There are several limitations to the present study that should be noted. First, the definition of insomnia in this study was similar to the diagnostic criteria of insomnia in the DSM-IV, and it qualified in every diagnostic criterion. Second, there are no statistics on the use of hypnotics in this study. Third, this study only included several potential confounding factors. In summary, insomnia, old age, stroke recurrence in the first-year follow-up and hypertension were high-risk factors for mortality over 6 years of follow-up in the large sample of patients with first-ever stroke. Participants with insomnia suffered a higher recurrence of stroke during the first year of follow-up. Whether prompt and efficient interventions for insomnia can decrease mortality in patients with first-ever stroke is still ambiguous. More studies are expected in the future. We thank all the clinicians, the patients and their families who had participated in this project. American Psychiatric Association. Diagnostic and Statistical Manual of Mental Disorders (DSM). 4th edn. Virginia, USA: American Psychiatric Association, 1994. Contributors All the listed authors have participated actively in the study and approved the submitted manuscript. C-XW, NZ and Y-JW: responsible for conception or design of the work, and approved the final version of the manuscript to be published. YY, QC and A-XW: acquisition, analysis or interpretation of data for the work. C-XW and B-YG: revising the paper critically for important intellectual content. L-JL: conducted the experimental studies and drafted the manuscript. Funding This study was funded by National Key Research & Development Program of China (2016YFC1307200), Beijing excellent talents training Program, the Ministry of Science and Technology and the Ministry of Health of the People’s Republic of China. Individual grants include the National 11th & 12th Five-year S & T Major Project (2006BAI01A11, 2011BAI08B01, 2011BAI08B02, 2015BAI13B03), the National Key Technology Research and Development Program of the Ministry of Science and Technology of China (2013BAI09B03), the Ministry of Science and Technology of the People’s Republic of China Beijing Institute for Brain Disorders (BIBD-PXM2013_014226_07_000084), the Beijing Biobank of Cerebral Vascular Disease (D131100005313003), the Basic Clinical Research Cooperation Program of Capital Medical University (16JL(TTZX)03), Beijing Brain Research (Z161100000216131) and the Beijing Municipal Science & Technology Commission (Z151100004015127 and Z151100003915117). Ethics approval The study was approved by the medical ethics committee (IRB) of Beijing Tiantan Hospital, which is affiliated with Capital Medical University.